In plain ancient Spanish, Patagon means Big Foot and/or a person with big feet. The Patagones or Patagonian giants are a mythical race of people, who first began to appear in early European accounts of the then little-known region and coastline of Patagonia. They were supposed to have exceeded at least double normal human height, some accounts giving heights of 12 to 15 feet (3.7 to 4.6 m) or more. Tales of these improbable people would take a hold over European concepts of the region for some 250 years, until they were substantially debunked at the end of the 18th century. "One day we suddenly saw a naked man of giant stature on the shore of the port, dancing, singing, and throwing dust on his head. The captain-general [i.e., Magellan] sent one of our men to the giant so that he might perform the same actions as a sign of peace. Having done that, the man led the giant to an islet where the captain-general was waiting. When the giant was in the captain-general's and our presence he marveled greatly, and made signs with one finger raised upward, believing that we had come from the sky. He was so tall that we reached only to his waist, and he was well proportioned..."
Pigafetta also recorded that Magellan had bestowed on these people the name "Patagão" (i.e. 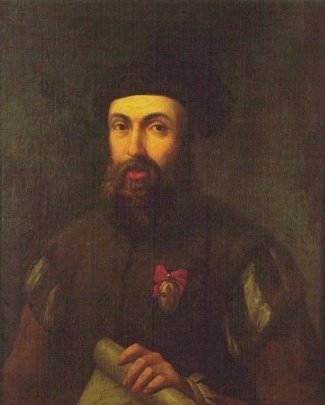 "Patagon", or Patagoni in Pigafetta's Italian plural), but did not further elaborate on his reasons for doing so. Since Pigafetta's time the assumption that this derived from pata or foot took hold, and "Patagonia" was interpreted to mean "Land of the Bigfeet". However, this etymology remains questionable, since amongst other things the meaning of the suffix -gon is unclear. Nevertheless, the name "Patagonia" stuck, as did the notion that the local inhabitants were giants. Early maps of the New World afterwards would sometimes attach the label regio gigantum ("region of giants") to the area. Another historical account for why the Indians from Patagonia were called Patagon or Patagones claim that Magellan ships made it to shore pushed by one of the frequent storms of the South Atlantic. Once ashore the spotted big foot prints on a sandy beach. They never got to see the Indians themselves, but judging by the size of the foot prints they named those peoples Patagones.